One useful way to collect resources on a topic is to check out the list of citations that previous papers on the topic have used. However, it often takes a lot of time to parse through these lists and import them into your citation management software one-by-one for inclusion in your own work. To copy the citation list from your article, open it as a word processing docuemnt (e.g., MS Word) or PDF, click and drag to select the text, and go to Edit > Copy. Depending on your file format, this might be easiest to do in multiple steps (copying one chunk of citations, moving on to Step 2, and then coming back). 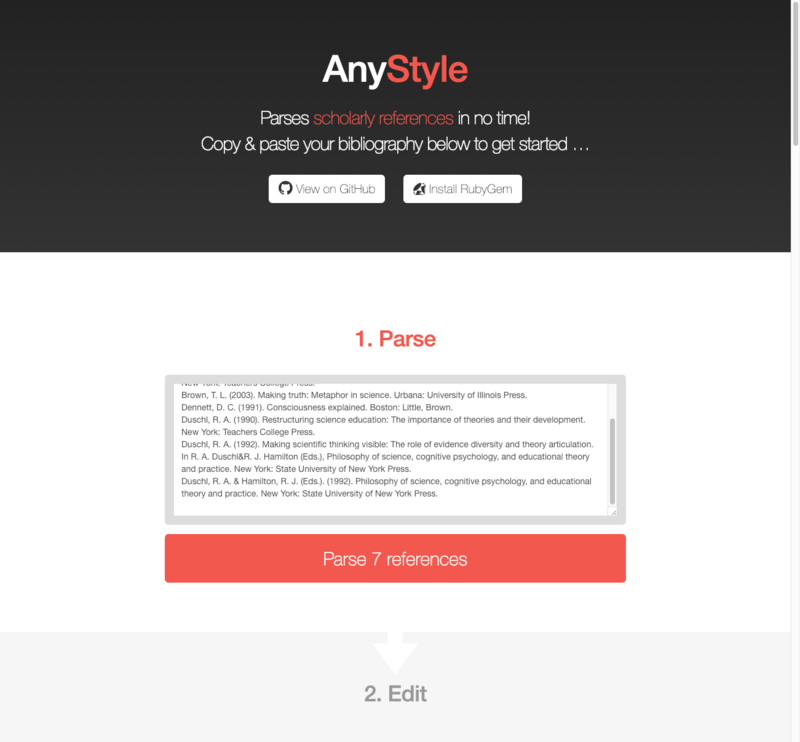 In a web browser, navigate to AnyStyle.io [http://AnyStyle.io] and paste your citations into the Parse box by placing your cursor in the box and clicking Edit > Paste. For best results, you should make sure that each citation is placed on its own line of text and that unnecessary breaks are removed. Click "Parse X references", and scan through results. If some words are mislabeled, click on the word (holding down Shift to select multiple words) and click "Assign label" to correct them. In the Save area, click BibTex. This will download a BibTex file with your metadata. In your citation management system, import the file (typically by going to File > Import or dragging and dropping the .bib file onto your open window).